Here it is, another cold snowy February day, with tons of friends and fellow genealogists heading off to Salt Lake City for the 2017 RootsTech conference. Minor little issues like work. Or family. Or that persistent issue called “finances” that so often rears its ugly head when what we want to do is head off and play. So… what to do to avoid falling into the doldrums? There are a variety of sessions from the RootsTech conference that will be livestreamed starting at 9 a.m. tomorrow, Wednesday, February 8th, that will let you check in on a lot of the fun from the comfort of your own computer screen. And recordings of the livestreamed sessions will be posted on the RootsTech website afterwards so you can catch up on anything you missed. 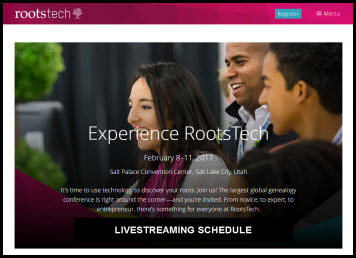 To tune in to any streamed session, just point your browser to the RootsTech home page at the scheduled time. The stream should automatically refresh at the beginning of each session. If it doesn’t, then you’ll need to refresh the page manually by clicking the Refresh button on your browser. I’ll be following along with Twitter on one screen, and the live-streaming sessions on my larger screen. Very happy to have at least some sense of how exciting all this is, along with the education! Cheers from the snowy-not-wet west coast. Thanks Judy! I’ll be listening in and enjoying from my Office! #NotAtRootstech in full effect here. Enjoy yourself!